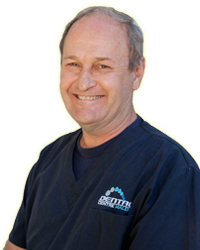 Dr Roger Dennett BDS (Sydney) FICD FADI, a Sydney graduate, has owned and operated 3 general dental practices over a 30 yr career. He moved to the Sunshine Coast in 2009, having worked in Sydney and Coffs Harbour previously. Roger has a particular interest in advanced restorative dentistry including crowns, veneers, bridges. He believes in offering the very best cost effective and family-based comprehensive dentistry to all his patients in a gentle and caring manner.